Thomas Roe is the owner and creator of TRoe Fitness, a Los Angeles-based personal training program "that can help anyone accomplish anything they put their mind to when it comes to setting nutrition and fitness goals." For his dedication to creating a healthier community, Roe was named ACTIVE's Personal Trainer of the Month for March 2016. Here are five of his favorite exercises. This article is part of a monthly series on ACTIVE.com. If you'd like to be featured as the ACTIVE Personal Trainer of the Month, contact hunter.hewitt@activenetwork.com for consideration. Rowing machines provide several benefits with little impact on the body. "Other then swimming, the rowing machine is one of the best ways to get a full-body workout, both anaerobically and aerobically," Roe says. According to Roe, rowing can be a great way to work on high-endurance training. Proper technique requires 60 percent legs, 20 percent core and 20 percent upper back. Depending on your current fitness level and goals, try short sprints of 500 meters or long, slow methodical sets of 2000 meters or more. Like rowing, jumping rope results in very little impact on the body. It's one of Roe's favorite exercises to warm up with or mix in with anaerobic training. "In addition to endurance training, skipping rope also trains the entire body as it incorporates just about every muscle group," he says. Roe says he challenges himself and his clients to strive for 500 repetitions in a row without stopping. "Based on the honor system, see if you can get 500 revolutions without stopping or skipping up," he says. "If you do, go back to one and try for 500 again." "I have always preached that if your core is weak, you are weak," Roe says. "This has never been more evident than now, as we age and spend more time sitting at a desk and less time exercising or stretching." To perform this exercise, stand in the center of the BOSU ball on one leg and place a yoga block or dumbbell about six inches in front of you. Try to touch the block or weight with your opposite hand, and avoid letting your opposite foot touch the ball or the floor. 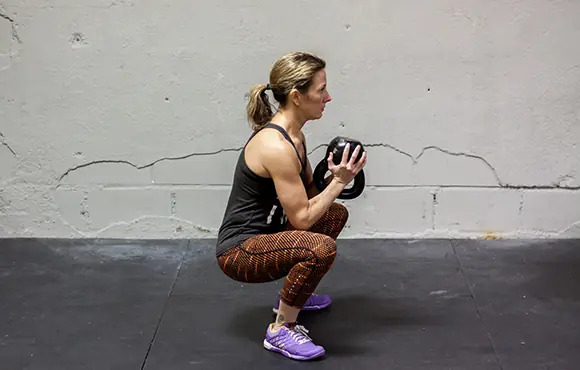 "If you can't accomplish this exercise, then you probably shouldn't be doing heavy weighted exercises like barbell squats or deadlifts," Roe says. "The overall benefit is a strong core, but also strengthening your focus." Note: If you don't have access to a BOSU ball, try using alternate balance equipment such as discs or boards. If those are unavailable, or too difficult, simply try the exercise without any equipment. Start with one foot directly in the middle of the BOSU ball. Jump side to side and perform a single-leg squat with the outside foot on each side. Continue for desired reps.
"This exercise is a great way to strengthen and open up the entire lower body as well as get your heart rate pumping," Roe says. "It isolates and focuses on all the major muscle groups in the legs." For a full-body workout, combine this exercise with BOSU ball lateral push-ups, as seen in the next slide. "This is probably the most demanding of all the exercises," Roe says. "Fatigue sets in real fast, and properly executing it requires a great deal of upper body strength as well as core strength." Place one hand in the middle of the BOSU ball. Your shoulder should be directly above your wrist. Drop down into a deep push-up position. While using your core, propel your body up and over the ball to perform a push-up on the opposite side. Continue alternating sides for the desired reps.
Want more tips from Roe? Check out five of the most important tips he preaches to his clients below. Are you interested in being featured as an ACTIVE Personal Trainer of the Month in 2016? Contact hunter.hewitt@activenetwork.com for more information.